Just over a month ago, JORD Watches approached me to do a review on one of their wood watches. Not only does it tie in nicely to the holiday season (as they are offering a giveaway for House on The Hill followers), but after appreciating my gorgeous new JORD Watch, I started thinking about "time" and how I've spent the last 18 months of it with my son. One of JORD's focuses for their watches is not just about the passage of time, "but in being aware of the need to make that time count," (from JORD Wood Watches). "Take Time" by Jenn Gigowski has been used with permission and is from http://www.busybeingblessed.net. There is a free printable of the poem for subscribers to www.busybeingblessed.net; please click on the image for the direct link. Our family became dependent upon a single income shortly after my son was born, and when I was informed I wasn't going back to work, I foresaw that I may be home with him for quite some time (given the challenging employment market). I decided early in this journey to find some fun programs that would stimulate his development as he grew, but would also provide me with a sense of community and connection as well. During this transition, I thought a lot about what I was looking for in programs we attended to avoid feeling isolated. Both mine and my husband's families were quite a distance away from us. The suburbs are population dense, and yet people often aren't really connected to who their neighbors are. I looked into mommy groups that my midwife suggested, and I joined a couple of online forums for local moms. Lots of information, but not a lot of real connection to others. Regardless of how the circumstances of how I came to have the opportunity to spend so much time with my son during his formative months, I knew wanted to ensure the activities we participated in allowed us to both laugh, learn, play and enjoy the memories we would have together. I believe the one thing new parents often wonder about as they try to envision getting involved in groups with their child is how they are going to find the "right" group to fit into, somewhere they will feel comfortable asking for advice on all of the tough topics and changes that children inevitably go through. I started with a mommy group hosted by a good friend, and soon I made connections and began joining other activities as well. I will share with you a few of the favourite programs that my son and I attended together in the last year and a half. If you happen to have family looking for a non-toy gift to provide to your child this coming holiday season, you may want to ask that they invest in a program for either themselves, or for yourself, where you can spend time with your child. Community Parent Groups: This included parent groups that were run through local organizations, such as the Early Years Centres (free drop in centres in Ontario that have with play areas and circle times, as well as other planned classes on topics like nutrition and adjusting to life after baby). Early Years Centres also had a dedicated Daddy/Grandpa/Uncle meeting group on Saturday mornings in my neighborhood as well. Another organization that ran local events in Ontario was called Life with a Baby (which was focused on building connection through a variety of activities as well). Some programs would have a fee associated with them over a set number of weeks, whereas others were a one-time event (such as a baby sleep workshop I once attended). Other activities simply required you to register 24 hours in advance & were more casual (stroller walks, yoga, mom and baby meet-ups). Library Programs: Some programs are free at local libraries, and others may require a small fee. Registering formally in a paid group has the benefit of ensuring that you will to have the same group of moms and babies every week so that you can build connections as you enjoy stories, toys, literacy together. Music Classes: These classes are often advertised by word of mouth (through friends or via Facebook groups) and often are hosted privately in someone's home. Alternatively, some are held in community centres as well. I've attended both and loved each of the atmospheres. They allow babies and toddlers (depending on the age of the class) to have some sensory play and exposure to a variety of musical instruments as well, while learning about colours, numbers, animals and other things through the songs that are sung together. Gym Classes: One thing that I certainly hadn't heard about before having my little guy that appears to be trendy are baby/toddler gym classes. I first learned about this through one of my new mom friends, and loved the concept of how the class would help kids to work on the motor skills they needed to develop next (my guy was not in a hurray to move himself), while also including things to help them learn a bit about literacy and colours as well. We attended a free trial class (offered by most children's gym centres) and we were hooked. Popular locations of choice include My Gym and Gymboree Play & Music. I would recommend these for any child from six months and onward. Often the price of the classes each month will also include one drop-in each week to an "open play" time as well (so you actually have two activities to attend). The staff are awesome and they build a relationship with you and your child. For really little ones who are less mobile, the staff will bring out play mats and baby toys as well as jumpers. The colours, lights, mirrors and brilliant decor at the centres make for lots of stimulation and great naps after each visit. Swimming Class: We always wanted our son to be comfortable in the water. Once he was about half a year old we enrolled him in a Parent and Tot swim class. I would recommend visiting the community centres you are considering in advance of registration to make sure the change rooms are comfortable for you to navigate, and that they have family change room facilities. Certainly the most daunting task was being alone with a little one, keeping them safe and also getting changed for the pool yourself (as many change rooms won't accommodate strollers). Also, ask the lifeguards how many toys, etc they have for the kids as a part of the lessons. Some centres will have almost none, whereas others have ample toys. As time has gone on, my husband has taken over this activity, and they have such a fun time together. I have learned so much after spending this time with my son over the past 18 months in these programs, making these memories together. As both a parent and an educator, it has changed me and my perspective on children, how they learn, and the impact I want to have in whatever work I do as I move forward in my career. I don't have the same career goals that I had before I started this journey. As the poem says, "the amount of time spent, should never be a regret", and it certainly isn't. It has a been a life changing adventure, often disguised as a very busy routine, but filled with so much joy, learning and new friendships. When JORD Wood Watches asked me to review one of their watches, I was excited to do so. A small piece of trivia for you - I love wood products and woodworking in part because my father loved it as well. During my childhood years, he worked in a wood factory building beautiful furniture. When he wasn't doing that work, he was usually building something at home on the farm where we lived. I certainly think it partially inspired my love of DIY and that my hard work ethic has come from that. Both are qualities I hope my son will also hold dear. And when my father saw the JORD Watch, he immediately fell in love with it. But it's hard not to love a JORD Watch, as it is absolutely gorgeous (and they carry both women's and men's watch styles). JORD Wood Watches are very lightweight, and really comfortable. I hardly even notice when I'm wearing it, and the face on it is larger than my metal watch (and yet I simply don't feel its' presence). These features are a huge advantage when I'm carrying around a heavy toddler and diaper bag to all of the programs (and I definitely need a watch to keep track of if we're on schedule for snack and nap times!). When I continue my career (beyond scheduling meals and nap times), the JORD Wood Watch can easily be dressed up or dressed down for work at home or in a more formal employment setting. It is eye catching and very versatile, and they come in a fantastic selection of both men's and women's styles. 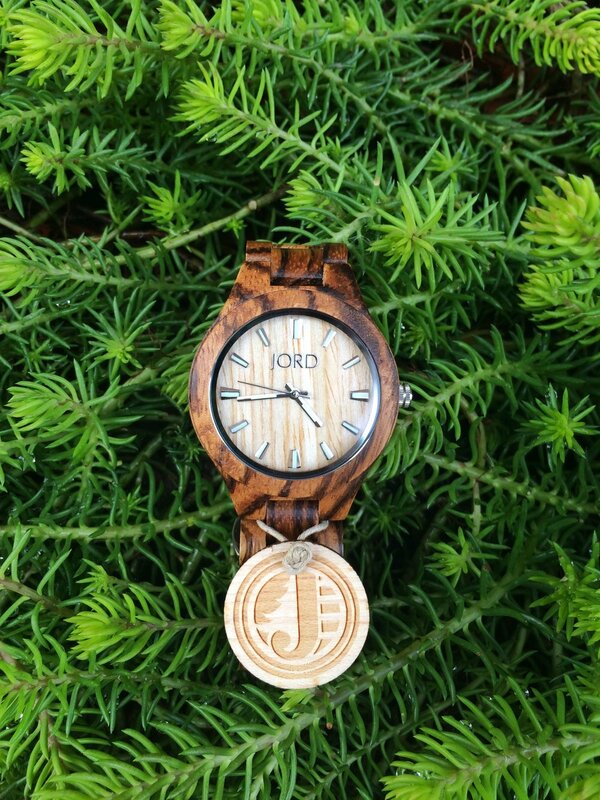 Do you want a JORD Wood Watch to wear while making your own fantastic memories? This is your chance! JORD Wood Watches has offered to give away a $75 gift certificate for one House on the Hill follower to use towards a beautiful JORD Wood Watch of their own! The contest for this $75 gift certificate is open until December 4, 2016, and the gift certificate will expire by March 31, 2017. Entrants for this giveaway are asked to click on the link below, and fill out your name and email to enter. And for those who can't wait to get started on their holiday shopping, everyone who enters the contest will be instantly emailed a $25 e-gift code to use on the JORD Wood Watch web site! CLICK HERE to enter the $75 gift certificate giveaway. JORD Wood Watches will automatically notify the winner. Good luck to all entrants! For more JORD Wood Watch Gift Ideas, as well as gift ideas for the entire family (Best Toys for Babies & Toddlers, as well as Non-Toy Inspired Gifts for Kids), see my Pinterest Board for further inspiration! This post was a collaboration with JORD Wood Watches. I was provided with a product in exchange for my honest review and my personal opinion on the product. Please see my disclaimer for further details.